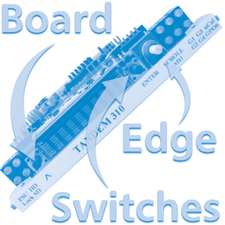 Using board edge switches on the module itself is one control option offered by Crystal Vision, and is available for most products in the Indigo range. Board edge control is not available for the Vision frame system. This method of control requires the Indigo frame front panel to be in the open position. So how does board edge operation work? The latest Indigo boards offer an intuitive board edge interface at the front of the module, with two push button switches (Up and ENTER) which allow the operator to navigate within the menu structure and a rotary encoder (SCROLL/ADJUST) which is used to navigate through the menu categories and adjust parameter values. Some older boards have piano switches which allow control options to be selected, with up and down positions for each lever. On some boards, jumper links can be moved to configure the board – such as to select input termination (75 ohm or 110 ohm), select output configurations or select the input and output format. Many boards have a ten character alphanumeric display on the front edge, which makes diagnosis and adjustment easy. Board edge LEDs are available on all Indigo boards and are used to identify the state of the power supplies, input format, GPIs and other features particular to that board. These LEDs may be used in conjunction with status information from any connected remote panel display or from the Statesman Lite PC control software. To use board edge operation on the module, you will need to set its local/remote switch to local.